Greetings again from the darkness. Much of what I write here contradicts my long maintained stance that a strong story/script is the basis for any movie worth it’s proverbial weight. This neighborhood crime drama does not spin a twisty plot. Nor does it flash fascinating and colorful mobsters. Instead, it’s the acting that elevates the film to the point of neo-noir must see. 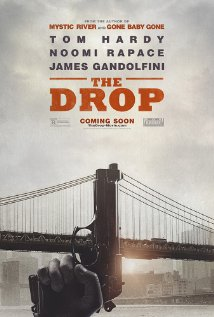 By now you have heard that this is James Gandolfini’s final movie. He passed away while director Michael Roskam (Bullhead) was in editing mode. Gandolfini plays Cousin Marv, a would-be wise-guy who never-really-was. Now he is bitter and desperate, in a beaten down kind of way. As a farewell, Gandolfini leaves us a final reminder of what a powerful screen presence he was, and what a terrific feel for character and scene he possessed. Beyond Gandolfini, the real attraction and the main reason to see the film is the outstanding and mesmerizing performance of Tom Hardy. In many ways, his bartender Bob is the polar opposite of his infamous Bane from The Dark Knight Rises. Quasi-effeminate in his vocal deliverings, and moving with a slow, stilted shuffle, Bob is one of the least imposing guys. The kind that you would likely look right through. At least that’s the first impression. Hardy is so nuanced, we aren’t even certain when his character transitions and exposes his true make-up. When he does, it’s the highlight of the film. Noomi Rapace, in yet another intriguing turn, plays local waitress Nadia, who befriends Bob after he rescues an abused puppy. Since the movie is based on Dennis Lehane’s short story “Animal Rescue”, it’s no surprise that the main characters each share a need to be rescued. Nadia’s ex-boyfriend is played to full psycho and creepy effect by Matthias Schoenaerts (so great in Rust and Bone, 2012). The scenes between Schoenaerts and Hardy show the movie at its tension-filled best. As with most neighborhood crime dramas, there are many secrets, local legends, and allegiances in doubt. The players are weary and dream of either better times or ending the misery. Mr. Lehane wrote the novels that led to some other fine films: Mystic River, Gone Baby Gone, and Shutter Island. He has a feel for ultra-realistic characters, and his material depends on extraordinary acting for fulfillment. This slow boil benefits from some of the best acting we could ask for. **NOTE: all due respect to the late, great James Gandolfini … we get a glimpse of him “running” from a crime scene, and his athletic prowess does detract from his otherwise imposing screen presence. **NOTE: how good must this be if I went the entire review without mentioning Ann Dowd or John Ortiz … two excellent actors who play small, vital roles? SEE THIS MOVIE IF: you need further proof that Tom Hardy is one of the more talented actors working today OR you bask in the atmospheric neighborhood crime drama genre (this is a good one) OR you just want to see a really cute pit bull puppy. SKIP THIS MOVIE IF: like me, you find it impossible to “unsee” a glimpse of James Gandolfini running on screen, in spite of his towering presence and acting ability. Greetings again from the darkness. On the surface, this looks like just another early season crime thriller. From that perspective, it works well enough. However, there are some elements that add complexity and interest, and set this one above the usual. It’s directed by Niels Arden Oplev who was responsible for the original (and very cool) Swedish version of The Girl with the Dragon Tattoo (2009). This looks to be his first English language feature and he re-teams with the exciting and talented Noomi Rapace. The film begins with a body in the freezer, and crime boss Alphonse (Terrence Howard) and his crew attempting to solve the mystery of who killed his friend and associate. Someone has been tormenting Alphonse with little clues and he falls right into the trap of jumping to conclusions. One member of his crew is Victor (Colin Farrell). We slowly learn more about Victor thanks to an awkward and slow connection between he and his neighbor Beatrice (Ms. Rapace). Their initial acknowledgment of each other is an exchange of waves between balconies. It’s an effective visual. The movie bounces between crime thriller and romantic/love story, and offers a couple of big ol’ shoot-em-ups. The added fun of secret missions from both Victor and Beatrice provide the twist this one needs. Actually there are 4-5 exceptional scenes in the movie which make up for the often plodding pace … not typically a good thing for a thriller. The pieces are greater than the whole, but that doesn’t mean it’s not an interesting watch. Noomi Rapace has quickly made the transition to English language films and she has the ability to play gritty or glamourous – something not all actresses can pull off. Colin Farrell is one of those actors who seems to consistently choose scripts that don’t showcase his skills. He was excellent in In Bruges, but often takes roles that require little more than flexing his world class eyebrows. The quiet scenes with Rapace and Farrell give this movie a higher quality feel than it otherwise would have had. In addition to Farrell, Rapace and Howard, we get some really enjoyable support work from Dominic Cooper, Isabelle Huppert and F Murray Abraham. Ms. Huppert in particular adds a touch of class and humor, and her character could have easily been expanded … same for Mr. Abraham. Cooper plays an idealistic, but not so observant buddy to Victor and loyal crew member of Howard. This one reminds at times of a couple of Mel Gibson revenge flicks: Payback and Edge of Darkness, though what really helps here is the strength of the cast and unusual scars of Victor and Beatrice. A slightly tighter script and improved pacing would have jumped this one a level or two, but it’s entertaining in spite of the flaws. Greetings again from the darkness. Normally if a sequel shows up a mere two years after the original, we would have good reason for low expectations (ie, The Hangover). However, director Guy Ritchie is back and just as importantly, Robert Downey Jr and Jude Law reprise their roles as Sherlock Holmes and Dr. Watson. Adding a few twists to the successful template provided by the original, the team delivers one that is sure to keep fans happy. The reason so many Sir Arthur Conan Doyle loyalists dismissed the first film is that the frenetic pace and towering action sequences seem to go against what made the original stories so great. So what does Mr. Ritchie do? He goes BIGGER and FASTER! There are three extended action sequences that are mind-boggling to watch. They work because the plot is so elementary, my dear. Professor Moriarty (Jared Harris) is out to cause a war from which he can personally profit. His plan involves guns, bombs and assassinations. Only our heroes can possibly stop him. Much of the odd-ball bromance from the first movie has been toned down here, and we get not only the return of Irene Adler (Rachel McAdams) and Watson’s new wife (Kelly Reilly), but also the introduction of a third female character – a gypsy fortune teller, Madame Simza (the original The Girl with the Dragon Tattoo, Noomi Rapace). Of course, McAdams character doesn’t last long, Reilly gets tossed from a moving train, and Rapace is given a few lines and a couple of sprinting scenes. There may be more women, but this is still a man’s world. The vision for this franchise is an updated version that encourages discovery of Holmes by a new generation. And while Downey is excellent, it’s difficult not to notice the similarities to Captain Jack Sparrow. Also, Professor Moriarty is very much a Bond-type villain. None of that matters too much as the rapid-fire dialogue between Holmes and Watson, and the crackling chemistry between Downey and Law, make this a fun time at a huge holiday movie. An added plus this time is a brilliantly written and executed chess match between Moriarty and Holmes. That scene fed my need for the more brainiac Holmes that I so adore. It seems odd that the release date for this one is so close to that of the new Mission:Impossible, but they both deliver what the fans want and hopefully find their audience. Even if you aren’t a fan, the fabulous sets and various world filming locations will keep you interested, even as you dodge giant explosions. Greetings again from the darkness. Part 3 of the Stieg Larsson Millennium trilogy brings to an end this fascinating multi-dimensional mystery-thriller centered around one of the most absorbing characters ever viewed on screen, Lisbeth Salander (Noomi Rapace). While I have anxiously awaited this final chapter, I must admit to a touch of emptiness in not having more to anticipate. As with any literary adaptation, there will be devotees of the written word who say the film versions don’t do justice to the books. I have purposefully waited until seeing all three films to begin reading the books. What I will say is that from a pure film perspective, the 3 films are fascinating, thrilling and pure joy to follow. As a stand alone, part 3 can be watched as a whole … however, I would promote the full benefit of watching the three in chronological order. The sum is much greater than any of the 3 pieces, though I will say that part one (Dragon Tattoo) is the superior film of the 3. Part 3 begins with a flashback to the end of 2, and has Lisbeth and her scumbag father in the hospital recovering from their violent meeting. Her goon half-brother Niedermann (Micke Spreitz) is on the hunt for revenge. Mikael Blomkvist (Michael Nyqvist) and his team at Millennium are putting together a comprehensive expose’ to help in Lisbeth’s defense and to prevent her from being institutionalized. This is where we really are introduced to the players of The Section, the secret society of Swedish Police. This group from the 60’s seems to have no boundaries and will do whatever necessary to prevent exposure of their group. Their power is on display early on. What follows is a very complex weave of intricate plot lines that fall across many levels of Swedish society. At the epicenter is Lisbeth and her knowledge of her father’s deeds over the years. Best to keep her quiet. As she recovers from her injuries, we see the Millennium team start putting the pieces together with the help of the police. Lisbeth’s attorney Annika, has little luck in convincing her to speak with an independent shrink to prove her competence. Instead it falls to Dr. Teleborian, who has been a source of misery for Lisbeth since childhood. How things come together is quite fun to watch. There are so many things that make Lisbeth captivating as a character. Her lack of trust in everyone. Her struggles to communicate with others in anything more than grunts. Her outright brilliance when backed into a corner. On and on. She is no white knight, but she does have her own body armor … spikes, piercings and hairspray. Lisbeth’s saga has been a movie-going pleasure and I am sad to see it end. Though Larsson is dead, it’s not difficult to imagine a writer picking up where he left off and come up with additional story lines. Until then, the best we get is the Americanized version with Daniel Craig and Rooney Mara. I trust Ms. Mara understands how high the bar was set by Noomi Rapace. Greetings again from the darkness. This is the second of Stieg Larsson’s Millennium trilogy, though we have a new director for parts two and three. Daniel Alfredson takes a more mainstream approach to filming and story telling and, of course, he loses the element of surprise we enjoyed in The Girl with the Dragon Tattoo, one of my favorite films of the year so far. 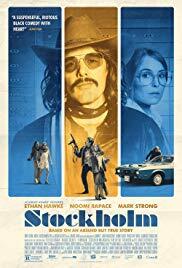 With Noomi Rapace and Michael Nyqvist back as Lisbeth and Mikael Blomkvist respectively, it certainly helps to have seen the first film to fill in the character development that this one assumes. We are treated to a more intricate, complex story line in this one, but the fun research part we enjoyed in part one, comes up a bit short. Swedish acting veteran/legend Per Oscarsson appears as Lisbeth’s first (and trusted) state assigned officer. He plays a small, but vital role and is quite interesting on screen – even at age 83! The story fills in some of the gaps on Lisbeth’s childhood and background but really leaves her a bit short on screen time despite being suspected of 3 murders. Lisbeth’s look is somewhat softer in this one and we get full on views of her eyes, which rarely happened in part one. I believe the movie suffers a bit by making it easier to relate to her as a wronged woman. Still, the story is much better than the average thriller and the two lead characters are more interesting than most. I look forward to the final film of the trilogy … The Girl who Kicked the Hornet’s Nest.